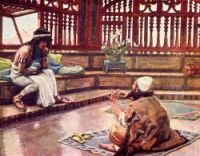 These Joseph Pictures show Joseph revealing himself to his brothers, after which they went home to Jacob to share their news of Joseph and his marvelous fortunes. Their father at first refused to believe them, but when finally convinced, he was filled with joy and resolved to go and see his son. This is just what Joseph had advised. 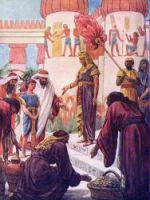 The entire hosehold--Jacob, Josephs' brothers and their sons, their wives and servants-- traveled to establish themselves in Egypt. 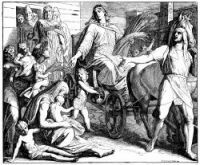 Judah brought Joseph word of his father's arrival, and Joseph hastened with his wife and two sons to the border of Egypt to welcome Jacob. 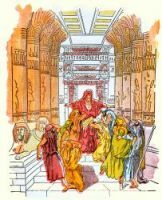 When Jacob was presented by his son to Pharaoh, the patriarch blessed the mighty monarch. Jacob also blessed Joseph's two little sons, Manasseh and Ephraim. 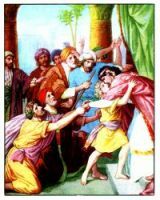 On the death of Jacob in Egypt, Joseph carried him to Canaan, and laid him in the cave of Machpelah, the burying place of his fathers. Joseph lived a hundred and ten years, having spent more than ninety in Egypt. Dying, he took an oath of his brethren that they should carry up his bones to the land of promise, showing in his latest action the faith which had guided his whole life. Like his father, he was emblamed and was put in a coffin in Egypt. His trust Moses kept, and laid the bones of Joseph in his inheritance in Shechem, in the territory of Ephraim, his youngest son. His tomb is, according to tradition, about a stone's throw from Jacob's well. On this page you'll find nine Joseph Pictures taken from my collection of antique Bibles and story books. You're welcomed to use these Joseph Pictures in your creative projects. Click on the Joseph Pictures below to see more details about saving a free Joseph Pictures or about purchasing the Joseph Pictures at a higher resolution.